The Canon IXUS 125 HS (also known as the Canon ELPH 110 HS) is a new camera in the stylish IXUS range, featuring a 5x optical zoom lens with a focal range of 24-120mm. The 16 megapixel Canon 125 HS offers a back-illuminated CMOS sensor, DIGIC 5 image processing engine, Full HD video capture with stereo sound and a HDMI port, 240fps slow-motion movies, a 3.5-stop optical Image Stabilizer, 2fps burst shooting, a 3 inch LCD screen, a Smart Auto mode which detects 58 different scenes and a range of fun creative effects. 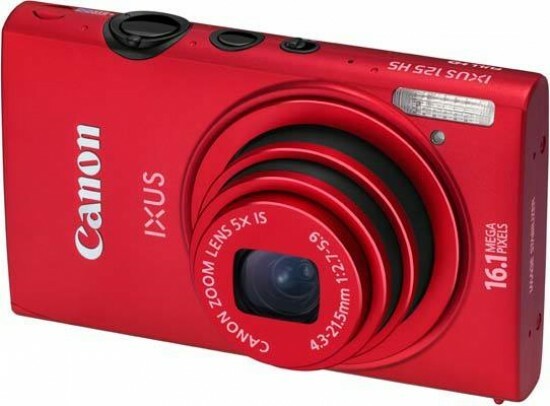 The Canon IXUS 125 HS / Canon ELPH 110 HS is available in in black, pink, red, silver, green and blue priced at £229 / €259 / $249. Looking for an ultra portable, largely auto everything pocket snapshot for those spur of the moment shots - but one that will possibly turn heads as you shoot? Announced alongside the Canon IXUS 500 HS at the start of the year, the typically fashion conscious IXUS 125 HS is £80 cheaper, but as far as headline resolution is concerned offers the higher pixel count of 16.1MP, as opposed to the 500’s modest 10.1MP, and from a 1/2.3-inch back-lit CMOS sensor. It’s also less boxy if more rectangular looking than the pricier IXUS, and sports softer rounded edges as opposed to sharp corners. Barely larger than a business card in width and height it slots comfortably into any trouser or shirt pocket. Official dimensions are 93.2x57x20mm and it weighs 135g. Thanks to being fashioned from aluminum, the IXUS 125 HS’ body feels solid yet lightweight with it when held in the palm. We had the minimalist-in-appearance light silver variety in for review, with red, pink, blue and green the alternatives. It follows on from last year’s HS (High Sensitivity) models in the 220 HS, 310 HS and most obviously the 115 HS, which offered 12.1 megapixels and a 4x optical zoom. Here the zoom is of the broader 5x variety, offering a focal range stretching from 24mm to 120mm in 35mm equivalent terms. In as far as the main features go then, the Canon IXUS 125 HS is pretty much your standard ‘class of 2012’ pocket point and shoot. 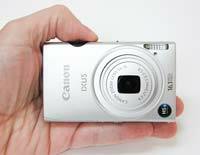 One thing that elevates the Canon IXUS 125 HS above rivals however is, unfortunately, the price. At a suggested £229, it feels a little steep when Nikon has a Coolpix L26 model with the exact same headline features of 16.1 megapixels and a 5x optical zoom for just £99. OK, so the Canon may be prettier and have a few unique functions that we’ll alight on in a moment, plus IXUS models have historically always commanded a slight premium, but can £100+ be justified? With a back illuminated sensor, an ISO range that stretches from ISO 100 up to ISO 3200 at full resolution, an optical image stabiliser offering a suggested 3.5 stop advantage, plus a four megapixel Low Light mode among the shooting options, Canon in part justifies the IXUS 125’s ‘HS’ suffix. Also included here is a latest generation Digic 5 processor, to not only improve performance but to help operation speed along too. If you do actually want to attempt low light work however you’ll ideally need a steady surface for resting the camera on or a tripod, as, to maintain the IXUS 125 HS’ clean lines, there is no handgrip here to speak of and the surface of the camera we found rather slippery. The two handed approach is therefore the best policy if you’ve no additional means of support. Try this though and the thumb of the right hand automatically comes into contact with the red video record button at the top right of the backplate. Thankfully then this control is slightly recessed - as are most of the buttons here and tiny too - in order to prevent inadvertent filming. With the Canon IXUS 125 HS there is a choice of shooting Full HD 1920x1080 pixels clips at 24fps or dropping down in resolution to 1280x720 and filming at a smoother frame rate of 30fps. Thankfully the optical zoom can also be utilized when recording, although it is much slower to move through its focal range. In stills mode the lens mechanics sound like a buzzing insect. We were able to shift from extreme wideangle setting to maximum telephoto in 2-3 seconds by holding a forefinger against the forward-facing lip of the zoom lever, though this extends to 10 seconds when shooting video. Still, despite the diminutive dimensions and entry level snapper status the camera does sport an HDMI output port to one side for hooking the camera up to a flat panel TV if purchasing the necessary lead as an extra expense. This port is located next to a joint port for AV and USB connectivity. The thin plastic flap that protects both does however feel a little flimsy and we can see this becoming weakened with prolonged use. As with any IXUS camera, exterior looks are as important as performance and go some distance to supporting a few extra pounds on the price tag. From the front then the IXUS 125 HS presents a relatively flat streamlined appearance, lens retracted within the body when the camera is inactive. Top right of the lens sits a small porthole housing the AF assist /self timer lamp, and directly above it, where it sits half on the face plate, half on the top plate, is the bulb for the on-board flash. The slightly alleviated profile here slightly helps prevent the fingers of the left hand inadvertently obscuring the flash when steadying the camera with both hands. The top plate layout recalls the IXUS 500 HS in that, in lieu of a shooting mode dial, a simple switch is provided for flicking between scene and subject recognizing Smart Auto, which has up to 58 pre-programmed scenes to choose from, and the more user-controllable Program Auto. In the latter mode access is additionally provided to a plethora of further shooting modes via a left-of-screen toolbar. This is brought up on screen if subsequently pressing the ‘function set’ button at the back. Next to this top plate mode switch is a recessed on/off button, and along from this again we discover the largest button here, the shutter release button, which is surrounded by the lever for operating the zoom. Power the camera up and as long as the date, time and time zone have been pre-set the camera is ready for action in just under two seconds, lens having extended from flush to the body to its maximum wide-angle setting with the rear LCD blinking into life. Whilst expectedly no match for a DSLR’s response, the IXUS 125 HS’ response is nevertheless fast enough for you to largely be able to capture the image you saw in your mind’s eye before powering up. A case in point: a half squeeze of the shutter release button and the IXUS 125 HS had determined focus and exposure in the time it took us to blink, auto focus point/s highlighted in green with an accompanying bleep of confirmation that we were free to press down fully and take the shot. Do so and it’s possible to commit a full resolution, Large, Fine quality JPEG to memory in 2-3 seconds; here said memory is a removable SD, SDHC or SDXC card as there’s no internal data capacity. Canon seems to have jettisoned an internal capacity in recent years - not that the meagre amount of data storage formerly offered was that big a help. For stills and video playback, a dedicated button has been squirreled away near the base of the camera on the backplate. With the 4:3 ratio LCD screen taking up most of the real estate here, the other controls are an even tinier menu button alongside it, the aforementioned video record button located nearer the top plate, and in between them is a familiar control pad with that ‘function set’ button at its centre for summoning up the toolbar of key shooting options and then effecting any changes. At points north, east, south and west respectively on this control pad are a means of adjusting exposure (here -/+ 2EV), summoning up flash options (auto, forced on, off, or slow synchro, with red eye reduction enabled separately via the menu screens), altering display settings (basically just the screen showing the very basic shooting options or none at all), and finally swapping focus range between infinity and macro. Here we’re able to shoot as close as 3cm from a subject and still come away with a sharp result. You can call up a nine zone compositional grid for practicing your rule of thirds on screen if wanted, though this is activated via the menu screens and then remains permanently on - it’s not activated or deactivated with subsequent presses of ‘display’ like on rival models. Returning to the role of the function/set button for a moment, as noted a press brings up a toolbar of key settings to the left of screen. If you are using the camera in Smart Auto mode, these extra options are limited to accessing the self timer, altering the drive mode, image aspect ratio (16:9, 3:2, 4:3 or, unusually, 1:1), recorded image size and movie quality. The latter can be downgraded from 1920x1080 pixels to 1280x720, or the standard resolution 640x480 pixels selected. Flick the top plate switch over to the Program Auto setting, denoted by a camera icon, and this list of LCD toolbar options grows longer. In this mode we can alter image compression level, choose an ISO setting between ISO100 and ISO3200, all at full resolution, alter white balance or metering mode (choose from centre weighted average, spot or evaluative), or drill into Canon’s My Colour mode options, which include some of the fun digital effects alongside mere colour adjustments. Here, as with last year’s model, Canon offers up fisheye, miniature, along with toy camera, monochrome, super vivid, and poster options. Joining these are a soft focus feature for more flattering portraiture, while the Movie Digest feature that shoots a quick low resolution clip each time a still is taken makes a return. Furthermore, as has been a feature of Canon compacts for quite some time, individual colours can be highlighted and swapped. Additional scene modes cover underwater photography, low light photography (whereby resolution falls to four megapixels to limit noise), snow scenes, a long shutter mode, plus hand-held night scene, burst mode (again a resolution drop to four megapixels in exchange for 5.8 shots per second; otherwise it’s 2fps at full res), a trio of further portrait orientated options including a skin smoothing filter and the ability to fire the shutter when a camera detects a face. There are also two stitch assist modes for shooting panoramas (panning left to right and vice versa). It might have been nice if Canon has included a 360° self-stitching panorama mode for complete beginners as many of its rivals now are. There’s no 3D capture option here either - though that may be largely because its maker doesn’t also have 3D TVs to sell. The last item on this list of shooting options is the Casio Exilim-alike Slow Motion movie mode. 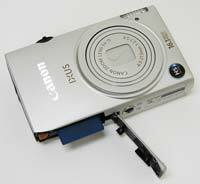 As on the IXUS 500 HS, this allows 240fps capture at an email-friendly 320x240 pixels. Moving our attention back to the camera back plate, and the last button is for the self-explanatory menu. Press this and we’re presented with two folders; one governing image capture and the second the set up folder. In the first folder we have a very brief array of options, including the ability to alter the size and location of the AF frame, call up on-screen grid lines as previously noted. and swap the image stabilization mode between continuous and off. The second folder presented here - the set up folder - allows sound and volume to be controlled, LCD brightness adjusted, and the memory card in use to be formatted; all pretty straightforward stuff then. Whilst the right hand side of the camera, if viewed from the back, features the output ports and a lug for attaching a strap, the opposite flank of the camera is devoid of features entirely. 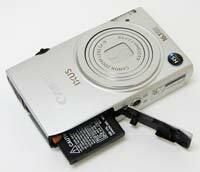 The base of the IXUS meanwhile features a screw thread for a tripod and a covered compartment housing both vacant memory card slot and rechargeable lithium ion cell. This is ‘good’ for a fairly miserly 170 from a full charge, which is below average and makes the supplied NB-11L lithium ion cell seem rather underpowered. Once again, and as with the IXUS 500 HS to an extent, whilst one could criticize the IXUS 125 HS for lacking much in the way of real photographic control, that’s largely missing the point. This camera is all about fuss free photo taking - and looking good while you snap away.